Do you feel that? It’s the heat of the summer finally starting to settle in. It’s hot, it’s humid, and you may be tempted to avoid the outdoors altogether in favor of air-conditioned indoor activities. But at Sail Wild Hearts, we’ve got the perfect way to beat the heat and stay cool all summer long. Choose a cruise and enjoy the great outdoors! Catch a breeze and feel the wind in your hair aboard any of our sails! There’s no better way to cool off than feeling the salty breeze blowing across your face at the start of every Sail Wild Hearts cruise. It’s like nature’s air-conditioning unit and on hot summer days, it’s a saving grace. Cool off in the Gulf with swimming, snorkeling, paddle boarding and kayaking on one of our more adventurous cruises. Options include our two-hour Snorkel and Sail Tour, three-hour Kayak Adventure Snorkel Sail, six-hour Dolphins and Blue Angels Sail or two-hour Family Adventure Sail. Prepare to get wet! Just make sure not to dive in with your phone in your pocket. Or, avoid the heat altogether with a Sunset Cruise. Once the sun begins to set and temperatures drop, spending time outside takes on a new appeal. Cuddle up with your honey on board this romantic two-hour evening cruise. Stay hydrated and cool with refreshments on board all our cruises. Bottled water is complimentary, and soft drinks are available for purchase. Adults can load up small ice chests with their own beverages to enjoy responsibly, as well. Whatever floats your boat! Don’t let the summer sun keep you from making the most out of your vacation. 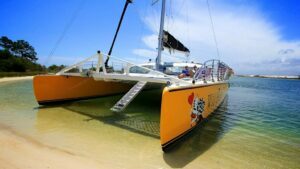 Keep it cool and book a cruise with Sail Wild Hearts!